As it is a quick review about the video devices supported and implemented by Ozeki VoIP SIP SDK, the following guide is intended to present how your webcamera and other related video tools can be especially useful in your VoIP communication system. Video is the technology of electronically capturing, recording, processing, storing, transmitting, and reconstructing a sequence of still images representing scenes in motion. The common name of a motion picture is 'video film', or shortly 'video'. The quality of a video depends on various factors. VideoFrame rate is the number of still pictures per unit of time of video. The bigger this number is, the better the quality. For digital videos the size of the video image is measured in pixels. To this size the term of 'aspect ratio' is connected. Aspect ratio describes the dimensions of video screens and video picture elements. It is a ratio between width and height. For recording a video film, a video camera is used in most cases. Web camera is also a kind of video camera. The video material can be forwarded instantly (in case of video chat) or stored for later. When you would like to see your recorded video you simply play it back. The quality of the result will depend on the features mentioned above (Figure 1). Ozeki VoIP SIP SDK delivers excellent video quality, therefore provides the best video chat experience for its users. You can integrate this amazing innovation into your application easily, and gain more customers than ever. 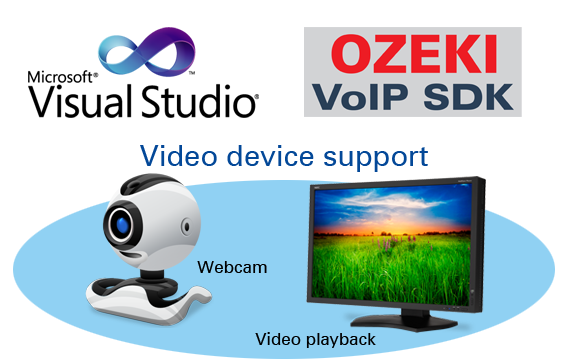 Ozeki VoIP SIP SDK contains an video device implementation as a base of the SDK. Without spending time with implementing the basics you can instantly start your project. After getting though this guide, you can get to know the basic knowledge about video devices and its implementation in Ozeki VoIP SIP SDK. If you have read through this page carefully, you already have all the knowledge you need to start on your own solution.